Situated next door to Dominos Pizza – Gary Cycles is at the back of Quayside Shopping Centre. 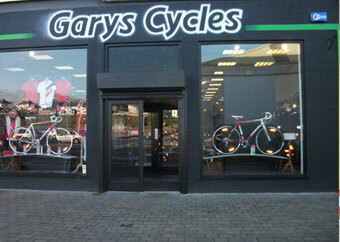 Gary’s Cycles is Sligo’s oldest cycle shop stocking brands such as Trek, Giant and Raleigh. They sell bikes all over the Northwest to a loyal customer base for the last 30 years. Stocking bikes to suit all ages and wages. Garry’s cycles carry a large range of Racers and Hybrids with all the accessories to suit. With a fully equipped workshop Garry’s Cycles will service all your cycling needs.